If we put a drop of ink onto a porous surface, how quickly does it get absorbed? It depends on drop volume, surface tension, viscosity and contact angle, plus some measure of the porosity of the medium - here a single pore radius and a porous fraction. The absorption process is complex and there are two competing theories, but they both show similar trends as you play with the sliders. For those who don't know their drop volume, enter a drop diameter in the 2nd row. From your contact angle, the volume of the spherical cap is calculated so you can use that as the input in the 1st row. 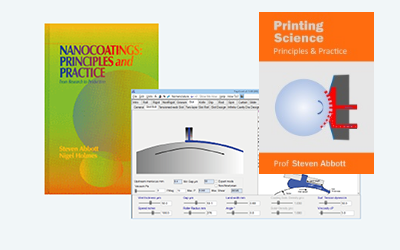 Suppose you have printed a drop onto a porous coating; how fast does the drop get absorbed? Both are plotted, with the time axis adjusting for attainment of 100% absorption by one of the formulae, up to a maximum of 100ms. The literature on dye-based inkjet drops suggests that Davis-Hocking is better. For pigmented inks both equations are irrelevant because the pigment tends to form its own diffusion barrier. For those who prefer to think in terms of an initial drop diameter, a diameter to pl converter is provided. It does not affect the main calculation, so you need to enter your pl value into the Volume slider. The calculations use your given drop volume to calculate parameters such as R and D, and plot the relative absorption rather than the absorbed volume.